The Apple rumor mill never stops spinning. While the hearsay of iPhone 6 dominating the headlines, whispers about what's next Apple's iPad Air, dubbed iPad Air 2 rages on. Now the much-expected second-gen iPad Air 2 finally comes out with a 9.7-inch LED-backlit IPS touchscreen and up to 1536 x 2048 (~264 ppi pixel density) resolution. Powered by Dual-core 1.3 GHz Cyclone (Apple A8X-based) along with Retina display at 2,048 x 1,536 ( 2K), the latest iPad Air 2 will surely deliver even better movie enjoyment experience than its predecessors. However, the new iPad Air 2 has limited storage space like many other portable devices and Apple doesn't seem to load a DVD-ROM on the new iPad Air 2, which are still the issues with many DVD collectors since DVDs takes a lot of space and are nit-pick at portable players. So it's urgent to save the end file as something that isn't too large and make it compatible with the iPad Air 2. Accordingly, you are suggested to rip DVD to iPad Air 2 viewable format first for smooth movie playback. Best DVD to iPad Air 2 ripper software for Mac (El Capitan) to copy DVD (copy-protected) to iPad Air 2 in AVI, MP4, MOV, iTunes, etc with no quality loss and 36x faster speed. You may rely on Handbrake rip DVD to iPad Air 2. But the upshot is disappointing as most DVDs are bogged down with copy protection which Handbrake cannot handle, not to mention the relatively backward devices support. For an invincible DVD ripper for iPad Air 2 that can both get rid of DVD copy protection measures and copy DVD to iPad Air 2 and other newest mobile devices, MacX DVD Ripper Pro is all what you need. Contributing to its constant upgrade, this No.1 Mac DVD ripper supports all latest DVD movies, regardless of CSS, Region Code, Sony ARccOS, Disney X-project protection, etc. It supports any generation of iPad, including iPad Pro/4/3/2, iPad Mini 4/3 with Retina, iPad Air 2/Air and keeps perfect balance between the video quality and output file size. After free downloading and launching this A-list DVD ripper for iPad Air 2 on Mac, import the DVD you want to convert by clicking "DVD Disc" button. You can also hit the "DVD Path" button to import DVD folder for converting. 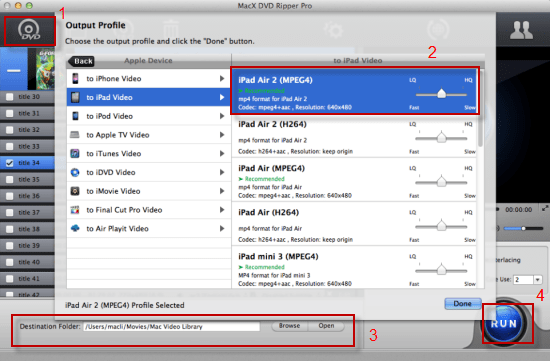 In order to rip DVD to iPad Air 2 playable formats, you can click "Apple device" in the drop-down output profile menu and choose to iPad video as the output format. Alternatively, you are allowed to convert DVD to MP4, MOV or M4V that iPad Air 2 supports. Finally, hit the bottom right "RUN" button to start to rip and copy DVD to iPad Air 2 on Mac. You can view the conversion process or cancel it at any time. After the conversion is over, you can transfer DVD to iPad with iTunes or alternatively, using the user friendly iPad file transfer tool - MacX MediaTrans. Note: MacX DVD Ripper Pro is preloaded with 359 preset profiles. Specifically, it not only allows you to rip DVD to MKV, MP4, AVI, FLV, WMV, etc but also permits you converting DVD to iPhone 6/6 Plus/6S/6S Plus/5S/5C, iPhone 7/7 Plus, iPad, Samsung Galaxy S7/Note 5, HTC One M10, PS4, etc. The advanced copy modes are right here for you to backup DVD to iPad Air 2 with a 2-hour DVD in 5 minutes only, which is truly worthy of your spending on the professional iPad Air 2 DVD ripper. Do you want to move DVD to iPad Air for enjoyment? This guide shares you a professional DVD ripper that is able to rip and convert protected DVD movies to iPad Air so that you can watch your treasured DVD movies on iPad Air wherever you go. Still seeking for the best DVD ripper for iPad to make utmost out of your iPad? Well, this article will introduce top 3 best DVD to iPad converters for Mac that can rip and convert your DVD collection to iPad accepted video format, so that you can watch DVD movies on iPad wherever you go.